Chinese President Xi Jinping held talks with Kazakh President Nursultan Nazarbayev in Beijing on Thursday, and they agreed to consolidate the traditional friendship and work together to forge ahead in achieving respective national rejuvenation of their countries. As an important neighbor, Kazakhstan is an influential power in the region, Xi said, noting that the relations between China and Kazakhstan have become an example of friendly relations for neighboring countries. China was willing to work with Kazakhstan to push ahead the process of building a community with a shared future for humanity, Xi said. The Chinese dream and Kazakh dream show the people-centered development concept and pursuit of a bright future, Xi said. Xi said that China and Kazakhstan should work together to help each other. China will, as always, firmly support Kazakhstan's domestic and foreign policies, and is willing to cooperate with Kazakhstan in deepening cooperation in areas such as fighting the "three evil forces" of terrorism, extremism, and separatism, and will closely communicate and coordinate with Kazakhstan in international and regional affairs. Five years ago, during Xi's first visit to Kazakhstan, he proposed building a Silk Road Economic Belt when touring Nazarbayev University accompanied by the Kazakh president. Xi said that in the past five years, the Belt and Road Initiative has received positive responses from the international community. The key to the progress scored in promoting the initiative is that it conforms to the trend of world peace and development and meets the aspirations for development and cooperation shared by countries along the route. The initiative has become an important practice in promoting the building of a community of shared future for humanity, said Xi. The Chinese president said that in the past five years, the cooperation between China and Kazakhstan in building the Belt and Road has entered a new stage of deep integration and mutual promotion. The two sides should strengthen policy coordination and implement the alignment of the Belt and Road Initiative and Kazakhstan's Bright Path economic policy, advance cooperation on production capacity, investment, economic and trade, energy, finance, connectivity, agriculture, innovation, and people-to-people exchanges, said Xi. China is willing to strengthen coordination and cooperation with Kazakhstan to promote SCO cooperation in all areas, and continuously enhance the cooperation under the framework of the Conference on Interaction and Confidence Building Measures in Asia, so as to make the conference better serve regional security and development needs, said Xi. Nazarbayev said China is a friendly neighbor and important partner of Kazakhstan, and his country values the traditional friendship between the two countries and also appreciates China's long-term support. China's development has brought opportunities to Kazakhstan, Nazarbayev said, noting that Kazakhstan supports the cause of socialism with Chinese characteristics for a new era, and believes the success is also in line with the interests of Kazakhstan. Nazarbayev said Kazakhstan firmly adheres to the one-China policy, and fighting the "three evil forces" of terrorism, extremism, and separatism. Kazakhstan is ready to work with China to support each other in international affairs and coordinate more under the framework of SCO and the Conference on Interaction and Confidence Building Measures in Asia, Nazarbayev said. The Silk Road Economic Belt, proposed by President Xi in 2013, will benefit regional countries, Nazarbayev said, noting that Kazakhstan is willing to promote synergy of the Belt and Road Initiative and its own Bright Path economic policy. After the talks, the two presidents signed a joint statement and witnessed the signing of a series of cooperative agreements. 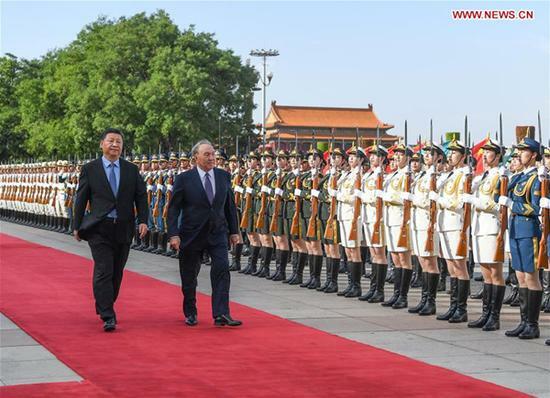 Prior to the talks, Xi held a welcome ceremony for Nazarbayev outside the East Gate of the Great Hall of the People.